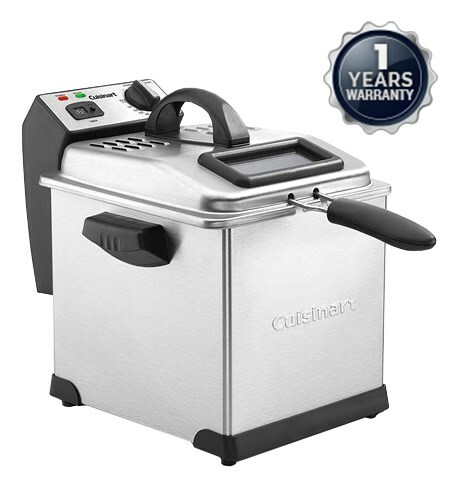 The Cuisinart CDF-170 is a compact deep fryer which is perfect for small batches. The 1800 watt heating element makes heating uniform and quick. Its 3.4-quartz oil capacity can fry up to 1.7 pounds of food in a steel mesh basket. The digital timer keep worries of temperature control away and makes operation simple. The Cuisinart CDF-170 has many exciting features for users of all types. 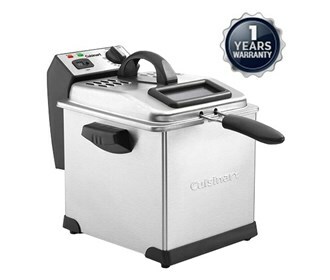 You can extend the lifetime of your Cuisinart CDF-170 with the purchase of a FactoryOutletStore Factory Protection Plan. See the Cuisinart CDF-170 gallery images above for more product views. The Cuisinart CDF-170 is sold as a Brand New Unopened Item.